With spring now in full effect, households across America have begun their spring cleaning tradition with the hopes to DE-clutter and rid their home of all the trash and dust it has collected throughout the year. While many people may cringe at the thought of all the anticipated hard work, there are a variety of cleaning professionals that are waiting to assist you. At Zakian Rug Cleaners, it is our mission to help restore your rugs to its original state. While our cleaning specialists can remove any stain, our expert craftsmen can help repair any damage. 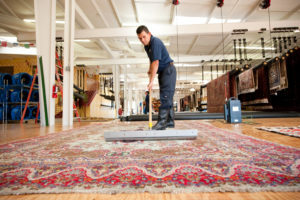 As Philadelphia’s largest, most trusted oriental rug cleaner, Zakian Rug is known for its quality services. Using only the finest and safest cleaning products, we guarantee that we can restore your rug to its original beauty. Although we are located in Philadelphia, our oriental rug cleaning is also in Norristown and other nearby areas. In helping you achieve your spring cleaning goals, our experts will provide you with the high-quality cleaning that your home needs. Using new rug cleaning technologies, Zakian Rug Cleaners can get your floors cleaner while preserving the color richness and yarn integrity. In addition to the variety of surfaces we can clean, our experts can help you recover your rug to its original state by riding your rug of any stain and odor, including the ones from your pet friends. With over 90 years in the rug cleaning industry, we are certified master rug cleaners who guarantee customer satisfaction. While we are located in Philadelphia, PA. we also service the surrounding areas to include Norristown, Southern New Jersey, and Northern Delaware. So if you’re looking for some help with your spring cleaning, trust our experts for your oriental rug cleaning in Norristown, Philadelphia, King of Prussia, or any of our other additional servicing areas. Although spring cleaning can be a hectic process, experts like the ones here at Zakian Rug Cleaners can help make the process substantially easier. Located in Philadelphia, PA we offer professional services to the city and nearby areas. Therefore, you can receive an oriental rug cleaning in Norristown, King of Prussia, Southern New Jersey, and many other nearby areas. Our expert cleaners can help you with your spring cleaning process by providing you with a detailed cleaning that is unmatched by our competitors. So call us today to schedule your cleaning.